What can I say? After going on a massive campaign of gathering some of the most brilliant baseball tips given by various baseball experts and innovative thinkers I’ve come to realize there is definitely no shortage of good baseball tips that can help young baseball players around the world become better ball players. Which is what we’re going to do today! 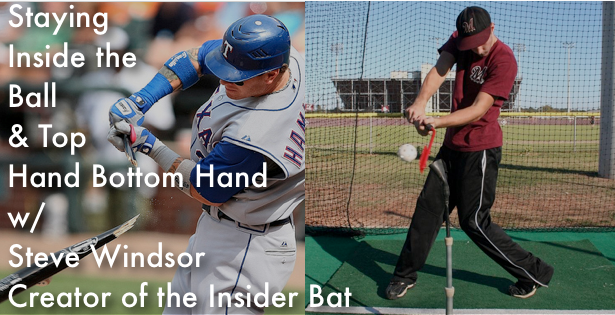 The creator of the Insider Bat, Steve Windsor is joining us today to share with you how you can dramatically cut the learning curve of attacking the inner half of the baseball, master the top hand bottom hand routine and instantly increase your productivity during your batting practice sessions. Steve will be giving away two…yes two FREE Insider Bats to lucky winners. Here’s is all you have to do. 2. Leave a comment telling us why you should receive the free insider bat and how it’s going to help your swing. Share your thoughts below. You know I love hearing your feedback! If you have any questions about batting tips, hitting drills, the 60 yard dash or you have an idea for another one of our interviews/ How to hit a baseball video series let me know as well! Buy your Insider Bat Today! Previous post: How to Hit a baseball like Robinson Cano by staying within your self!